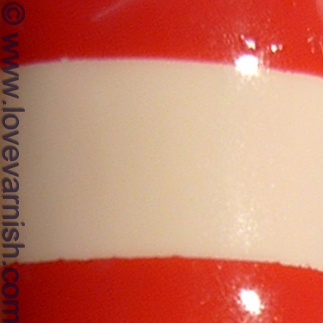 Love Varnish: 31 Day Nail Art Challenge - Striped Nails! 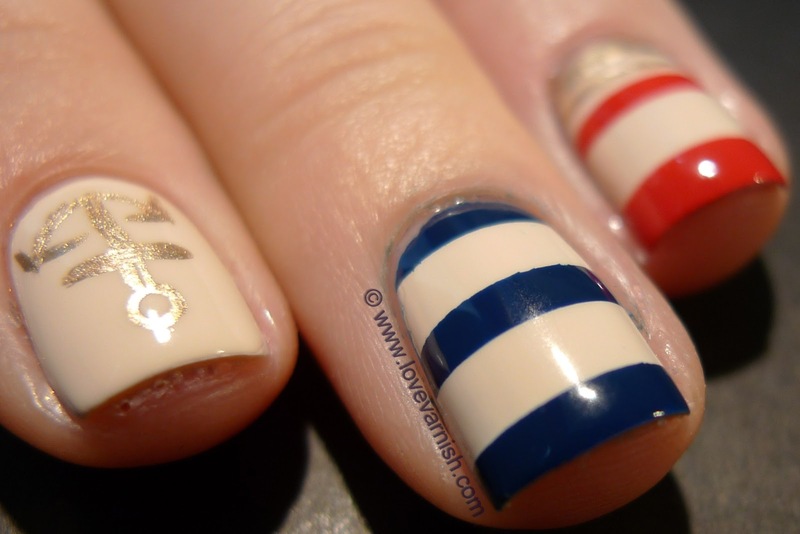 31 Day Nail Art Challenge - Striped Nails! 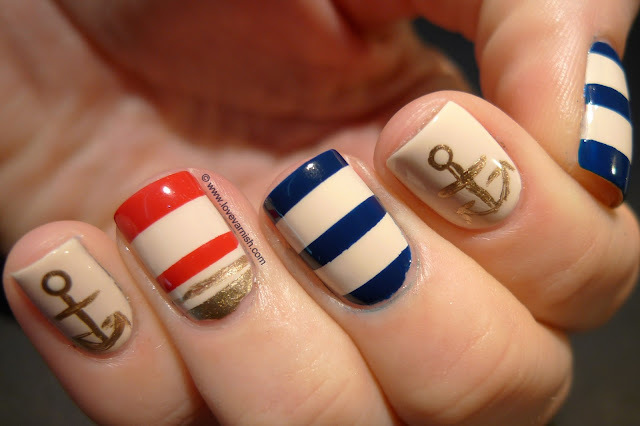 Deborah's manicure - Ay ay, sailor! Hi loves! Can you believe I already prepped this manicure not last Sunday, but the Sunday before? I had this idea pop up in my head and knew I wouldn't have much time after that day to make this work, so I just jumped on it. Glad to finally be able to show you! I started with a base of 2/3 coats of OPI My Vampire Is Buff. Seriously, if you don't have this shade yet.. GET IT! It is amazing, a soft base for all kids of nail art and not boring to look at when you want to wear something classy but pure. After it dried, I used some regular scotch tape to tape off sections on my thumb and middle finger, and a combination of scotch tape and striping tape was used for my ring finger. I used OPI I Saw.. You Saw.. We Saw.. Warsaw for the blue and Essence Fame Fatal for the red, and China Glaze 2030 for the gold stripes. I also used that gold polish to freehand some anchors (they don't look too bad, do they?) and after it settled for a while, I topcoated everything. Voilà, nautical nails all done! What kind of nail art would you do for this challenge? Tell us in the comments! Hi everybody! We've finally had some very nice and sunny days here in The Netherlands. 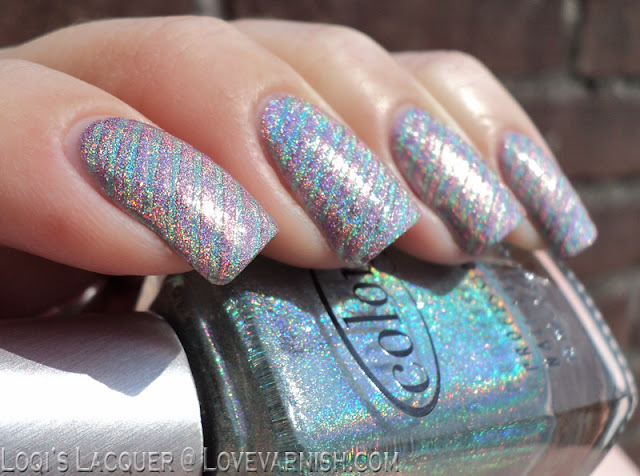 And for me that means one specific thing: holographic polishes! 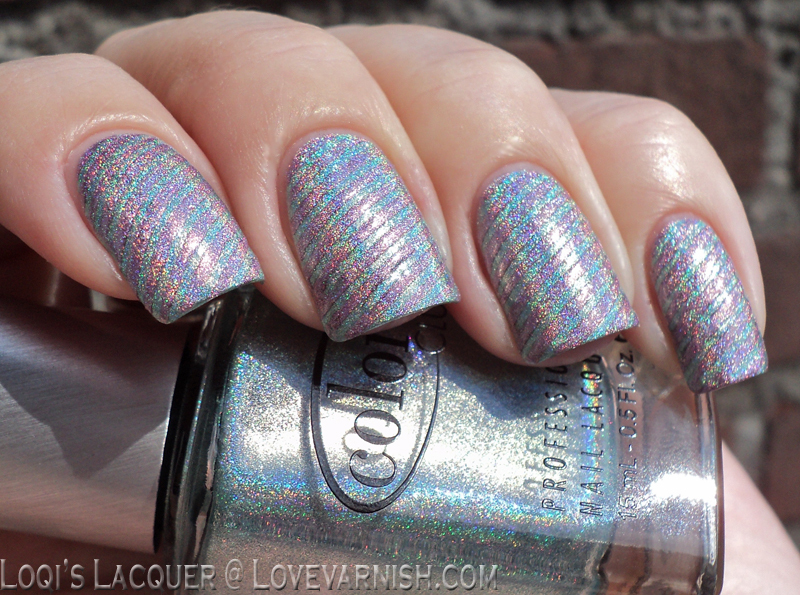 So for today's challenge I thought I would do holo stripes. I started off with a base of Color Club AngelKkiss, a blue toned green holo, and let that dry. Then I put a gazillion pieces of striping tape on all of my nails (yes, I did both hands!) and put 2 quick coats of Color Club Cloud Nine, a pinkish purple holo, over it and pulled the tape off. I chose the Color Club polishes because they can be topcoated without losing the holo effect, and tape-manicures get some texture to them witch I wanted to minimize. But this is what you really wanted to see right? Holobomb whooooo! Stay tuned for challenge day 13: Animal Print nails! 31 Day Nail Art Challenge - Polkadot Nails! GORGEOUS!!!!! That took alot of time and patience :) well done!! Your second manicure is amazing! 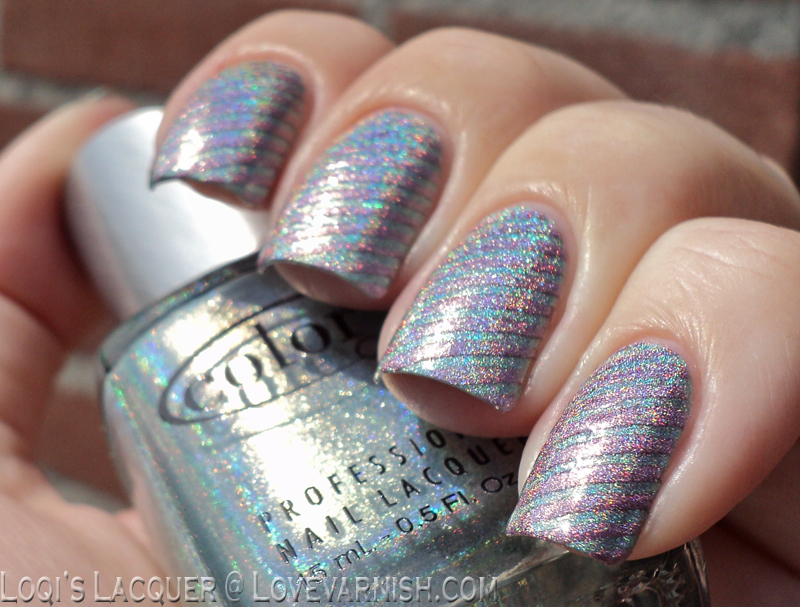 You really need patience to do such a great manicure! The one Loqi did must have taken LOTS of time indeed! Thanks for your compliment! Aww thank you ♥♥♥. And YES you want it! You want it immediately. You know we are 2 different people right ;)? Deborah did do a great job didn't she? I love it too! Thanks! It did take a long time! You don't have to :D! Thanks dear ♥.